The company engaged in "deceptive business practices," according to the U.S. government. The company is fighting the allegations. 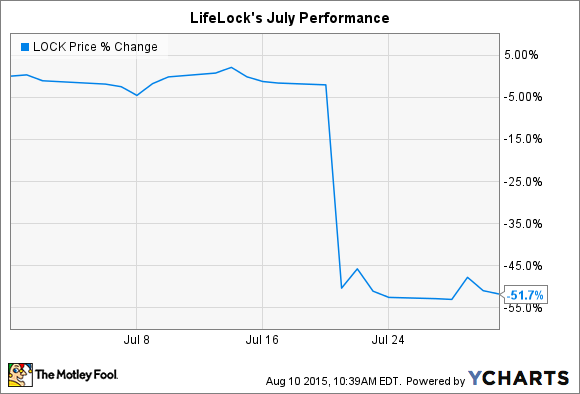 What: LifeLock (NYSE:LOCK), which provides identity theft protection services to 4 million consumers, saw its stock tank by 52% during the month of July, according to S&P Capital IQ data. The collapse put shares at a dramatic 60% loss over the last year. The stock has continued to fall in August. So what: LifeLock's stock slumped immediately after the U.S. Federal Trade Commission announced allegations claiming that the company violated a prior settlement with the FTC and 35 state governments over deceptive business practices. This allegation involves the core of LifeLock's business; it states that the company failed to adequately protect its customers' most sensitive information, including credit card, bank account, and Social Security numbers. The FTC also alleges that LifeLock made "deceptive claims" that it was safeguarding this data with the same high-level protections that are in place at financial institutions. The company's management believes the government is wrong: "We disagree with the substance of the FTC's contentions and are prepared to take our case to court," said Lifelock in a press release on July 21. Now what: Just a week after the FTC allegations were announced, LifeLock posted solid second-quarter earnings results that included an 18% jump in subscribers and 25% higher sales. The company also swung to profitability as average monthly spending per member rose to $12 from $11 in the year-ago period. Subscriber renewal rates ticked higher as well, which demonstrates broadly improving operating trends for LifeLock's identity protection products. Still, the negative publicity surrounding the FTC's allegations promises to reverse those gains, at least over the short term. Management lowered its sales and profit forecast on the assumption that the lawsuit "will cause an increase in attrition and headwind to our new member acquisition," explained Chief Financial Officer Chris Power. Executives are emphasizing the fact that the FTC's allegations involve past, not current, business practices. And the company contends that no LifeLock customers were actually victims of identity theft as a result of the violations that the government claims. But those points might not be enough to protect the company from a massive hit to its brand that could convince customers to jump to competing services.